MAG-TS’s performance, design characteristics and ease of installation make it ideally suited for metal fabrication, sawing, woodworking and general measurement applications. a magnetically encoded tape. The tape is made of a ferrous backing affixed to a flexible magnetized rubber substrate that is protected by a stainless steel cover strip. The flexibility of the MAG-TS encoder allows you to mount the tape around the circumference of a rotary table on a boring mill. 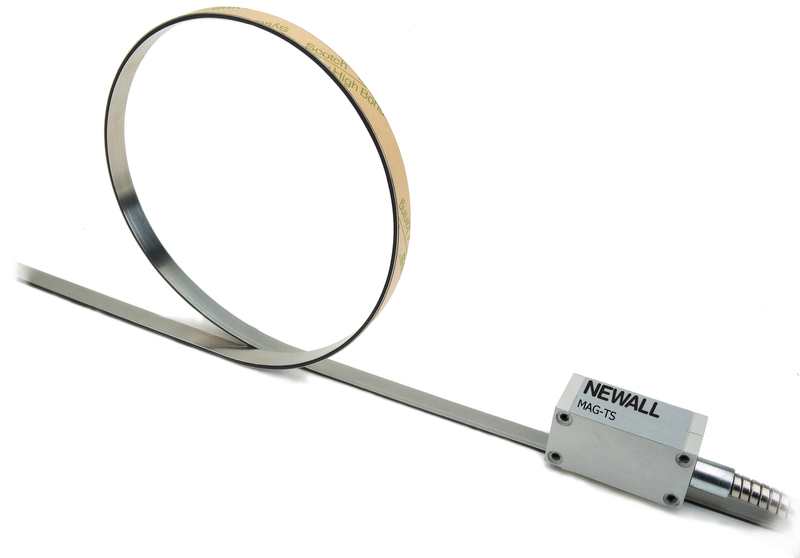 Angular readings can now be displayed with the use of Newall’s DP1200 or SA-100R DRO. The MAG-TS can be mounted directly to the machine surface by using the provided adhesive strip. Alternatively, the tape can be attached to an optional backer bar that is then mounted to the machine surface. The reader head should be mounted such that the correct gap height (0.5mm +/- 0.02mm) is maintained along the entire travel of the machine. The MAG-TS tape should not make contact with a magnetic stand or permanent magnet during installation, use, or maintenance. Permanent damage may occur.